Categories: Laser cut MDF movement trays, NAPOLEONIC PERIOD. 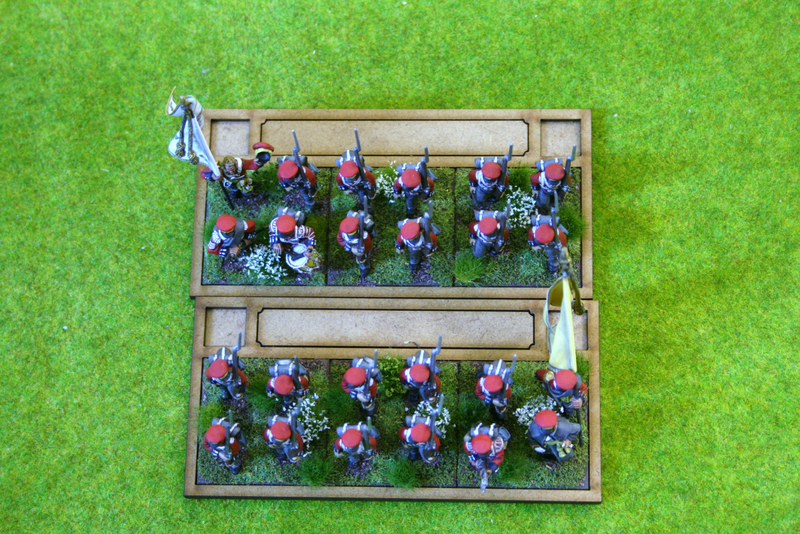 These movement trays have been designed specifically for Napoleonic units to be used when playing Black Powder Napoleonic games. They are suitable for other units and rules sets. You will receive two trays that will each take 12 infantry figures mounted on 20mm square bases or 40mm bases as you decide. So each set will hold a battalion of 24 figures. 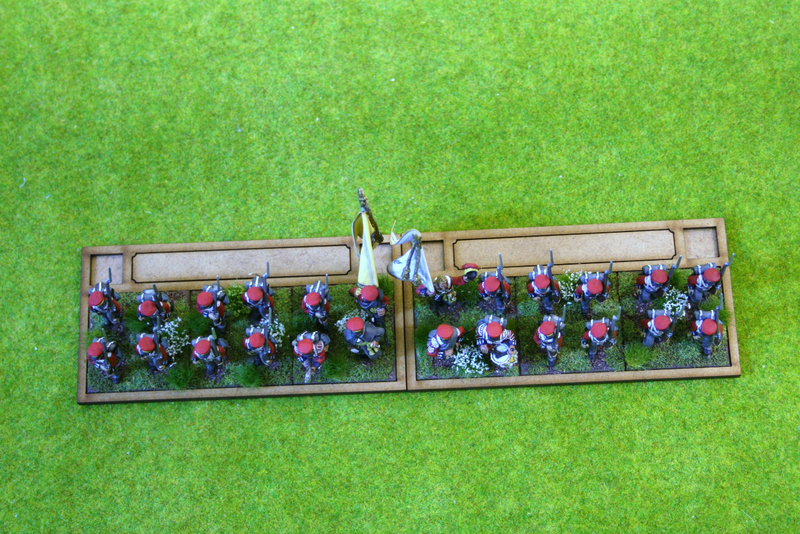 The trays make moving units around the battlefield easier and safer and help with transporting your units. The bases are not included but are available from my shop. Either Renedra plastic bases or laser cut MDF are suitable. 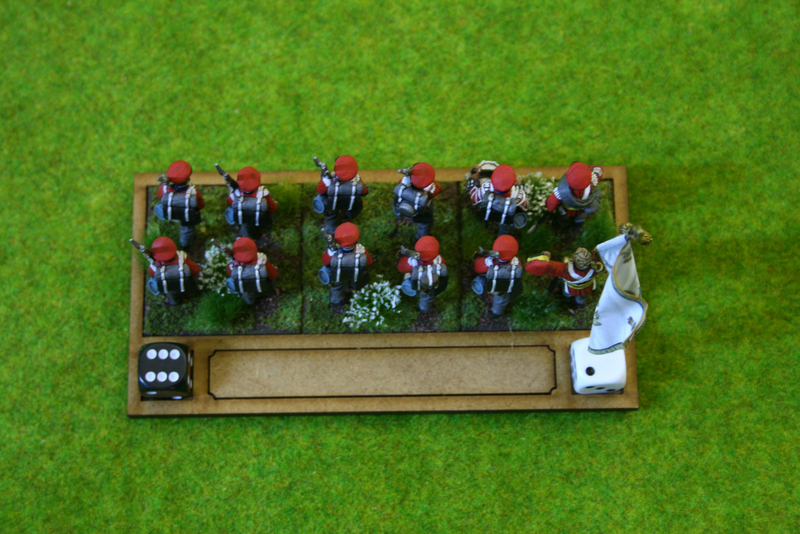 The movement trays feature cut outs at the rear of the tray to take 12mm dice that will indicate the casualties the unit is carrying or whether disordered or not. The central plate is removable and can be used to label or name the unit for battlefield identification. Please check out the gallery pictures to see how the trays will work. The figures shown are not included in the sale but are there for demonstration purposes. Gallery picture 1 shows the tray components. Gallery picture 2 shows a battalion in line. Gallery picture 3 shows a battalion in column (or square if one unit reversed). Gallery picture 4 shows the dice markers in place black 6 = disordered, white dice = casualties taken. 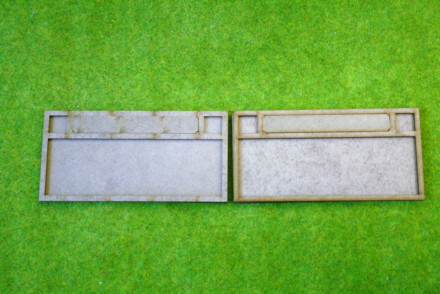 Laser cut from MDF they come as standard with a 2mm base and 2mm top section, this fits perfectly with 2mm Renedra or MDF bases. 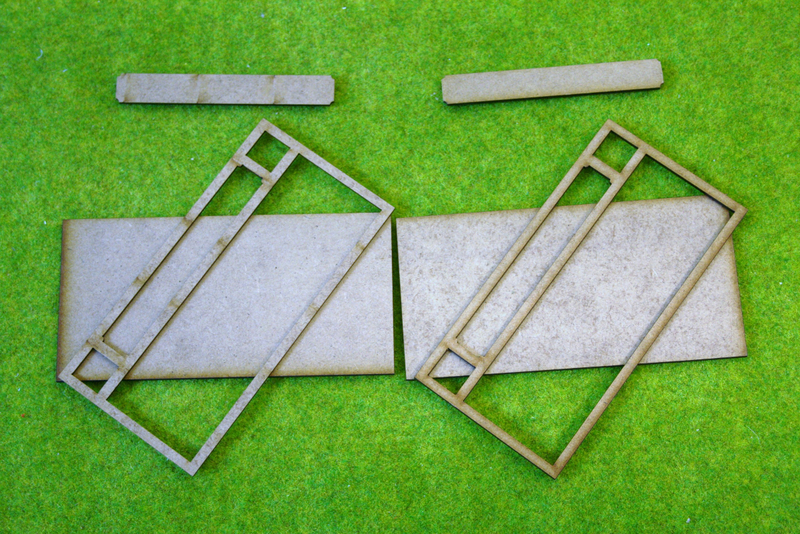 The Movement Trays will require assembly using PVA or super glue to attach the border trim to the base. You may use the trays in their natural finish but if you wish, they can be painted or textures using the appropriate materials. For more information and to see how I use these trays, go to the Arcane Scenery Blog. PLEASE NOTE that the bases and figures and dice shown in the picture are not included but are shown to clarify the size of the tray.